This book covers the fundamentals of digital signal processing (DSP) in a concise format, accessible to anyone with a technical background, enabling the reader for further DSP training, research, and development. 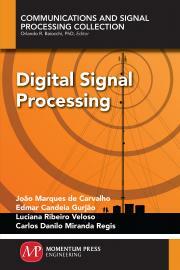 The authors explore many subjects, including discrete time (digital) signals and systems, with emphasis on linear shift invariant (LSI) systems; Fourier and the z transforms; signal sampling and analog-to-digital (A/D) conversion. The book finalizes with examples of DSP techniques applications to practical problems from several areas. João Marques de Carvalho graduated with a degree in electrical engineering from Federal University of Paraíba (UFPB), Brazil, and obtained his MASc and PhD from the University of Waterloo, Canada. He is also a retired free titular professor of electrical engineering at Federal University of Campina Grande – (UFCG), Brazil. Edmar Candeia Gurjão graduated with a degree in electrical engineering from UFPB, Brazil, obtained his master’s from UFPB and doctorate from UFCG. He was a visiting professor at the department of electrical engineering at Notre Dame University, USA and currently he is an associate professor of electrical engineering at UFCG. He is an expert on compressed sensing, software-defined radio, signal processing, and applications of linear algebra. Luciana Ribeiro Veloso graduated with a degree in electrical engineering from UFPB, earned his master’s from UFPB and doctorate from UFCG. Currently he is an adjunct professor of electrical engineering at UFCG and an expert on signal and image processing and computer vision. Carlos Danilo Miranda Regis is professor of the Federal Institute of Education, Science and Technology of Paraíba – IFPB. He has his doctorate in electrical engineering with emphasis in signal processing from UFCG. Carlos is leader of the digital signal processing group (GPDS) of IFPB and chief editor of Principia Magazine. He is also an expert on video and image processing and biological signal processing.